Turnip – Purple Top Milan is a delicious and very reliable variety with purple tops and white skin. Related to: Cabbage, Brussesls sprouts, kale, cauliflower, radish, turnip, kohlrabi. 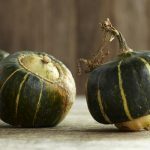 What is commonly known in Ireland as a turnip is really a swede so if you want to grow your turnips do buy a packet of swede seeds and refer to the swede page. The ‘real’ turnips are less used or grown in Ireland. 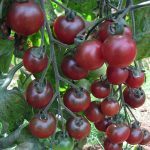 However, they are very easy to grow and are very quick to mature. 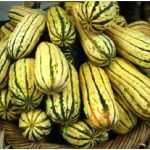 You can often harvest them 8 to 10 weeks after sowing. Their roots may be flat, round or elongated; the flesh is white or yellow. History: The turnip has been a favourite since the Roman times. Soil and site: Turnips prefer cool, moist conditions. They will grow in a range of soils provided they are reasonably fertile. Compost application is highly beneficial. The ideal pH is 6.8. If your soil is more acidic you should add ground limestone. Sowing and planting: Outdoors from early April onwards (if soil conditions allow). They should be sown thinly in shallow drills 2cm deep. The seedlings should be thinned to the recommended spacing as soon as possible to prevent the roots from intertwining with each other. 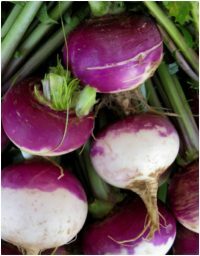 In order to get a continuous supply of turnips, you can sow from April until July every three weeks. Rotation: It is absolutely essential to keep turnips in the brassica section of your rotation to prevent a build up of the numerous brassica pests and diseases. Plant care: Keep well weeded and water during dry spells. Harvesting and storage: Baby turnips can be harvested when the roots are about 5cm in diameter. Instead of the recommended 15cm spacing between plants you could space them 10cm apart and harvest every second root while it is still small. Turnips should always be eaten fresh. They are not as well suited for long term storage as swedes. From the successional sowings you can expect to harvest turnips from June until October. Potential problems: Turnips are susceptible to all the brassica troubles and, as with the swede, fleabeetles cause most havoc. Sow a few plants every three weeks.